These days, your customers may too busy to drop in your stores but they still want to update their interested products. Thanks to Mageplaza Product Alerts extension, your customers can subscribe to get notification for out-of-stock products or price change. The notification emails of restock items or better prices will be sent to related customers. By this extension, online stores save a lot of time and effort for advertising since they can keep in touch with their potential customers, hence helps boost sales and profit significantly. Cron Schedule: Insert the value to run cron which decides email sending frequency. With default cron will run every 1 hour. You can refer this link for detailed instruction. Choose Yes to allow notification email of price change of subscribed products. Install SMTP to avoid email to spam box. When customers click to that link, a popup displayed allows customers subscribe for notification of price change. All subscribers will get notification emails whenever their favored items are offered at a better price. Apply for Customer Groups: You can choose one or more customer groups to send emails. Email Template: Access to Marketing > Email Templates > Add New Template to create Email Templates. 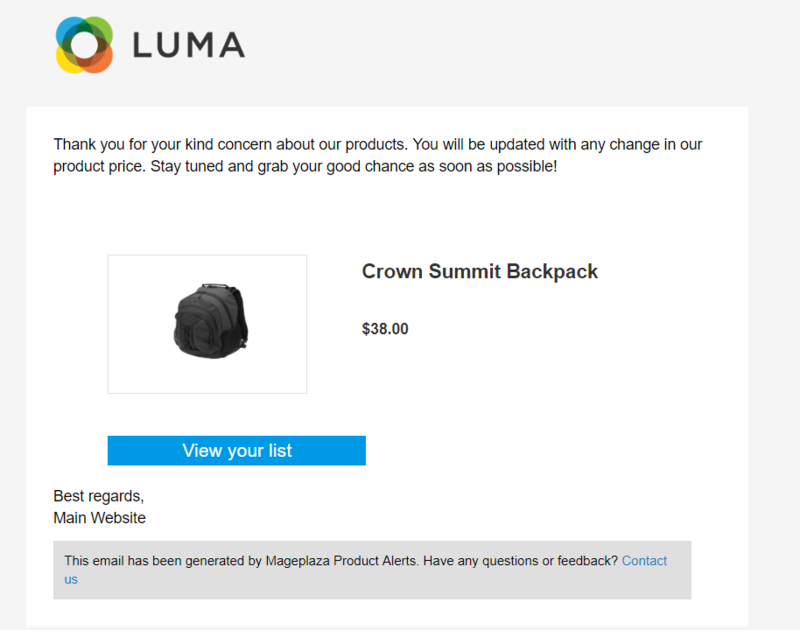 Please choose the email template that you want to send for price change of products. Popup Heading: Add the Title for Popup. Allow showing popup when customers click to Notify me when the price drops and only show popup with not-log-in customers. The default heading is: Stay tuned for any updates on this product's price! Popup Description: Insert the description for your Popup. The default description is: Subscribe Price-Change Alerts now! Register your email address to be the first to know when our product has any changes in price. You are always updated to get product pricing goodness! Button text: Add the button name for popup. When customers insert the email correctly, click to this button to subscribe notification of price change. If you leave it blank, the default button is: Notify me! Footer Content: Insert the note or warning to your customers, which is displayed at the footer of Popup. If it is left blank, the default content is: Kindly notice that the price notification email will be delivered only one time, and your email address will not be shared or published with anyone else. 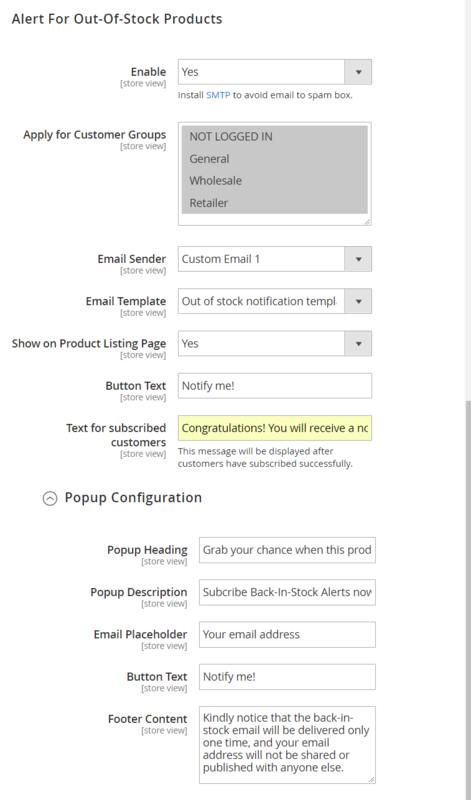 Choose Yes to allow notification emails of restock of subscribed products. Install SMTP to avoid email to spam box. 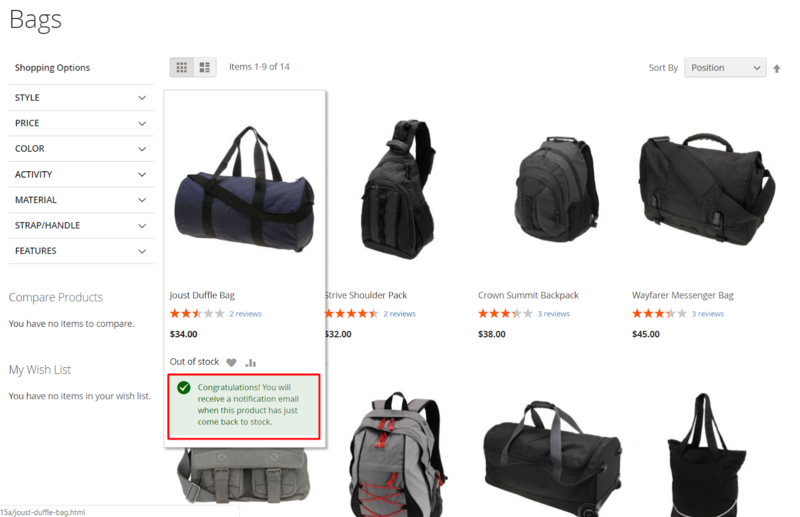 When customers click to that link, a popup displayed allows customers subscribe for notification of back-in-stock products. All subscribers will get notification emails whenever their favored items are restocked. Email Template: Go to Marketing > Email Templates > Add New Template to create Email template. 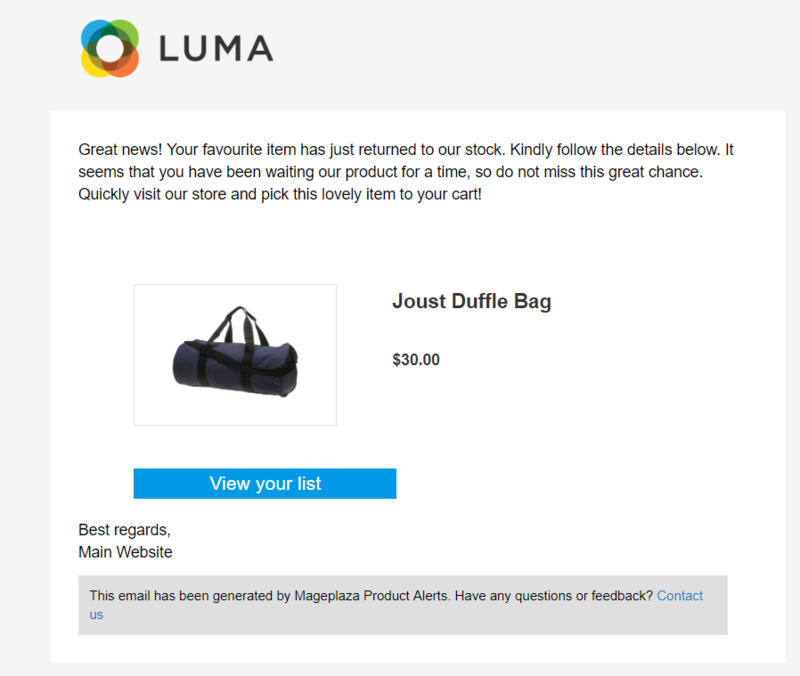 Please choose the email template that you want to send to your customers when their favorite items are restocked. 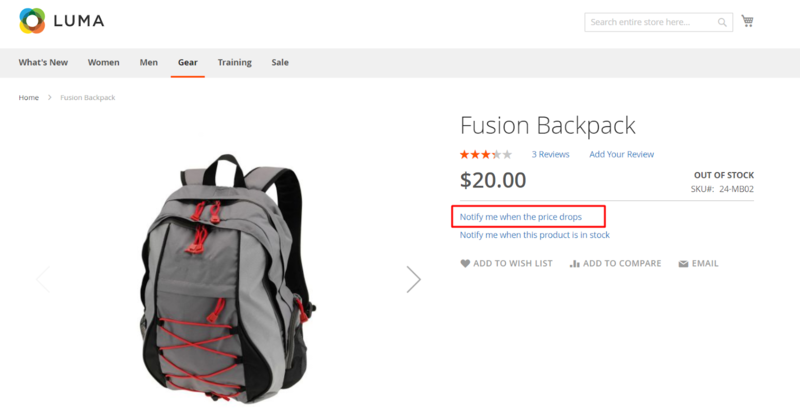 Button text: Name the Button to be shown at Product Listing Page. When customers click on this button, they can register to get notification emails of restock items. If you leave it empty, it will be Notify me as default. 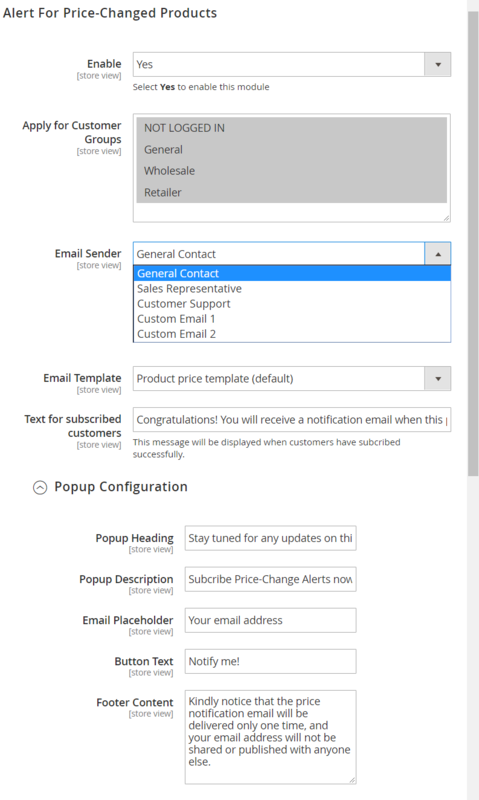 Text for subscribed customers: Insert the message you want to send to customers. This text is displayed after subscribing successfully, so customers can subscribe only once. For example: Congratulations! You will receive a notification email when this product has just come back to stock. Add the Title for Popup. Allow showing Popup when customers click to Notify me! and only show Popup with not-log-in customers (Notify me! button is the name set for Button text). If you leave it blank, the default message is: Grab your chance when this product back in stock! Popup Description: Insert the description for your Popup. If you leave it empty, the default description is: Subscribe Back-In-Stock Alerts now! Register your email address to be the first to know when our product comes back. Do not miss your chance! Button text: Add the button name for popup. 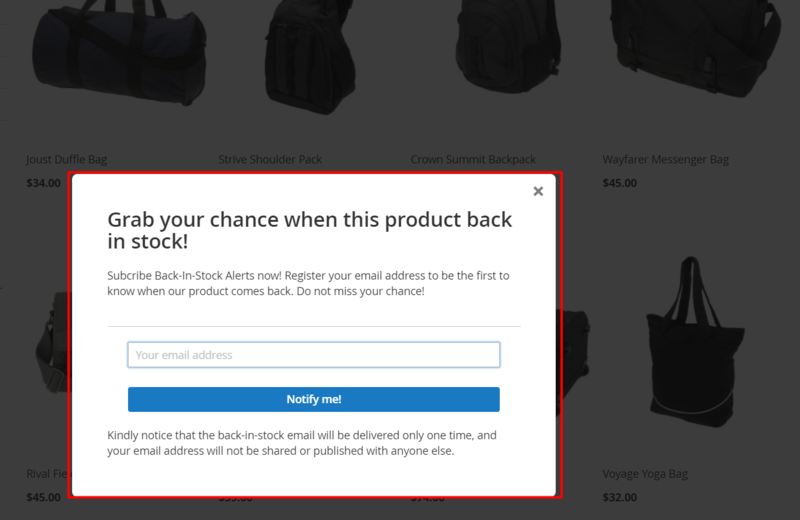 When customers insert the email correctly, click to this button to subscribe notification of restock products. If you leave it blank, the default button is: Notify me! Footer Content: Insert the note or warning to your customers, which is displayed at the footer of Popup. If it is left blank, the default content is: Kindly notice that the back-in-stock email will be delivered only one time, and your email address will not be shared or published with anyone else. Product SKU: Insert the SKUs for products that customers want to be notified when they are out of stock and restocked as well. This is a required field. Customer Email: Insert the customer emails to get notification when products are in stock. This is a required field. 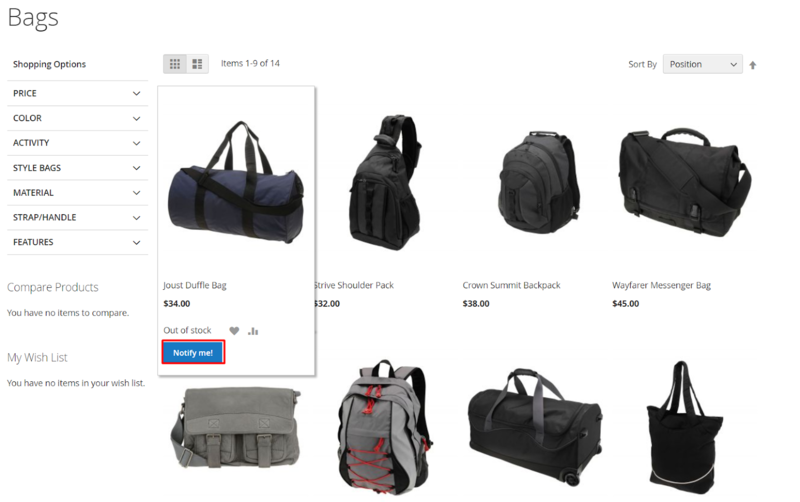 Store View: Select the store views whose products can be subscribed for out of stock notification. Status: Show the product status after subscription. Status will be change along with the change of product SKU, Product name and Customer email. Created At: Show the time of subscription only after subscribing. Note: When you click to Save or Save and continue edit, the system will send email to the customers who have subscribed notification. 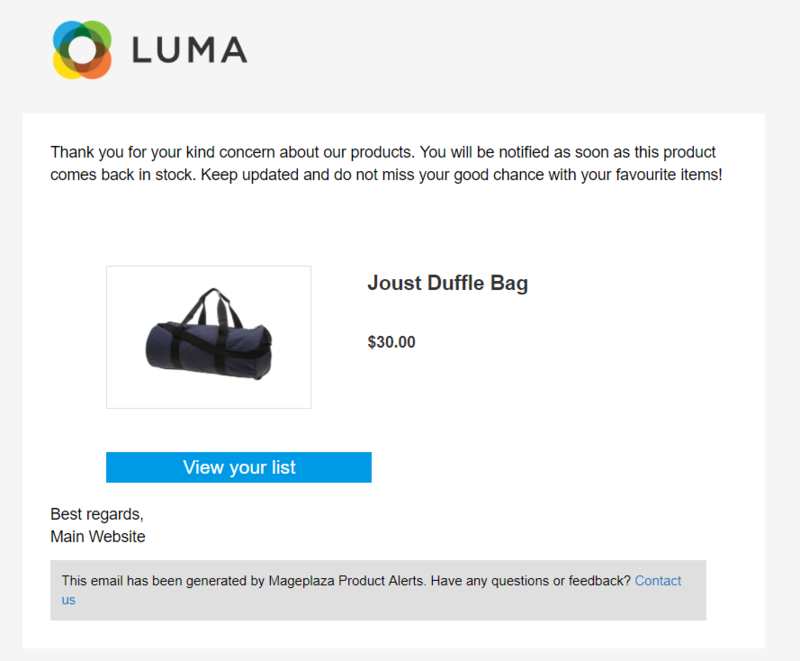 If you click Sent or Resent, the system will send emails to customers notifying of back in stock products. 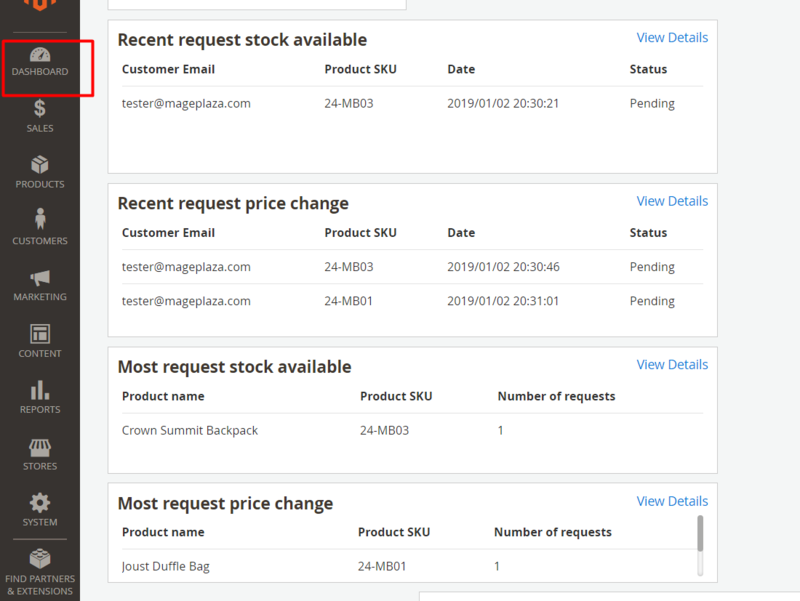 This part reports the most wanted products based on the data of customers subscription of restock items, which includes: Product name, Product SKU, Number of Requests, etc. The subscribed products which are canceled will not be reported here. Basing on the above data, this module enables generating the chart of most requested products. The horizontal axis is Product SKU whereas the vertical axis is Number of Requests. 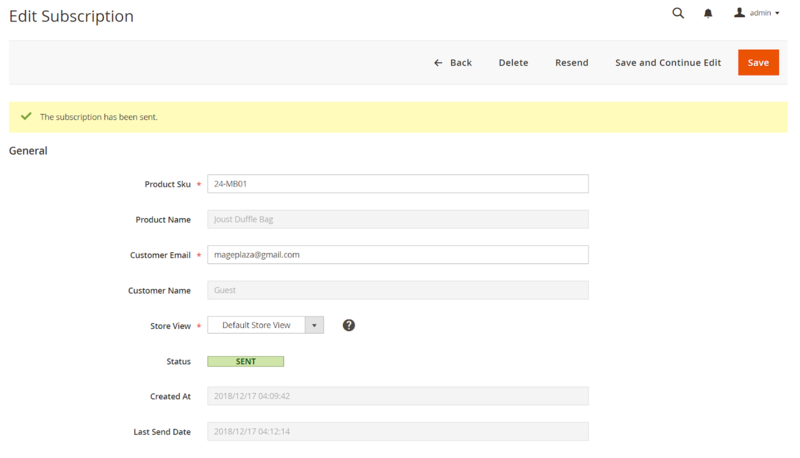 Login to the Magento Admin, choose Catalog > Product Alerts > Product Price Alerts. Product SKU: Insert the SKUs for products that customers want to be notified when they have better prices. This is a required field. 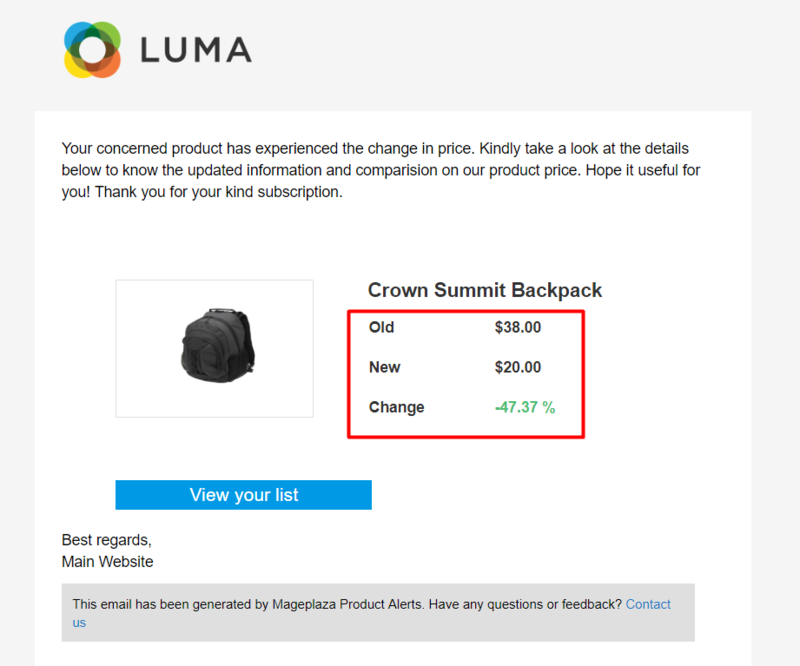 Customer Email: Insert the customer emails to get notification when product prices are better. This is a required field. Store View: Select the store views whose products can be subscribed of price change notification. Note: When you click to save or Save and continue edit, the system will send email to the customers who have subscribed notification. 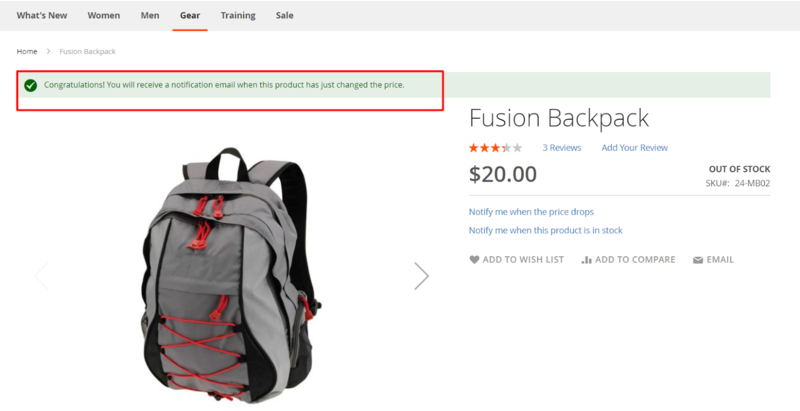 If you click Sent or Resent, the system wil send emails to customers notifying of back in stock products. This part reports the most wanted products based on the data of customers subscription of better price items, which includes: Product name, Product SKU, Number of Requests, etc. The subscribed products which are canceled will not be reported here. Using the above data, this module enables generating the chart of most requested products for better prices. The horizontal axis is Product SKU whereas the vertical axis is Number of Requests. 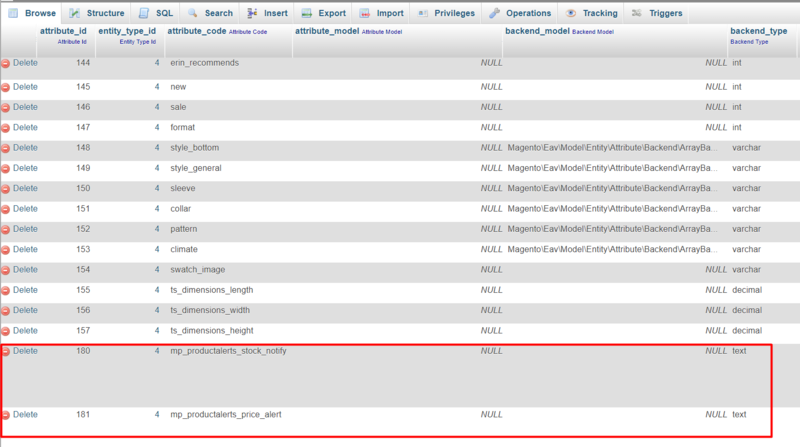 Login to the Magento Admin, choose Catalog > Products. This part records the subscribers’ information ( both for out-of-stock products and better price products notifications, which includes: Customer name, Customer Email, Subscribe Date, Last Sent, Send Count. Stock Status (Magento default): Select the stock status including In Stock and Out of Stock. 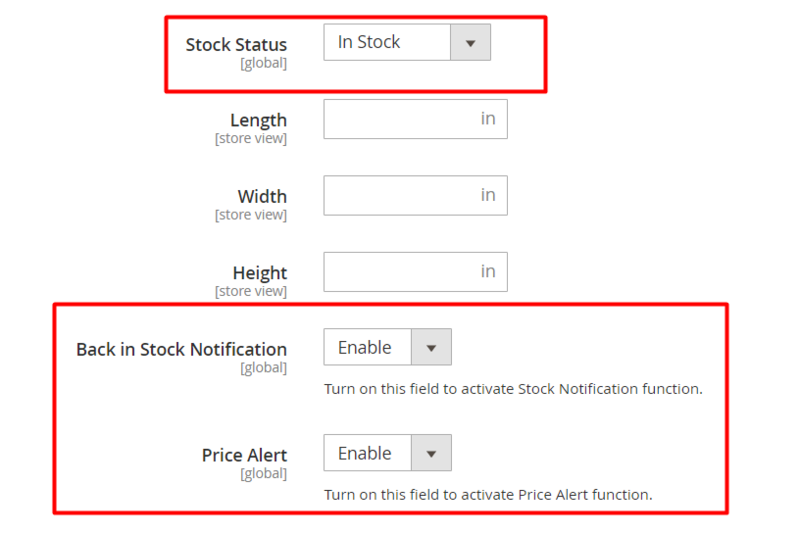 Back in Stock Notification: Turn on this field to activate Stock Notification function. Choose Enable, then the link Notify me when this product is in stock will be displayed on product page. This configuration applies for each product. Price Alert: Turn on this field to activate Price Alert function. Choose Enable, then the link Notify me when the price drops will be displayed on product page. This configuration applies for each product. Note: Click View Your List button, visitors will be redirected to My product alerts where all the subscribed products of them are listed. 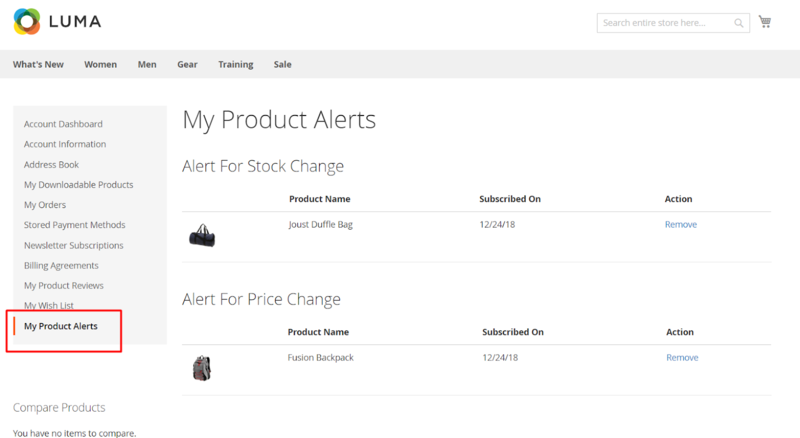 At My product alert, customers can view their subscribed products of out-of-stock and price change notifications.